It’s been a crazy few weeks here. I’ve been baking like crazy, trying to catch up on work, and I haven’t been cooking dinner as much as normal. While I normally cook 6 nights a week, I’ve only been cooking 3-4 nights a week. 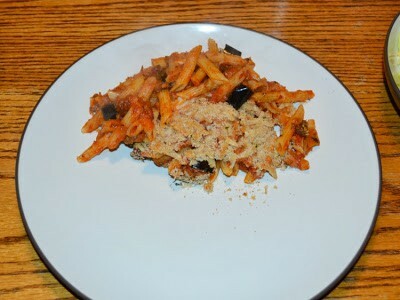 Most of the meals are easy favorites that I’ve been making for years. 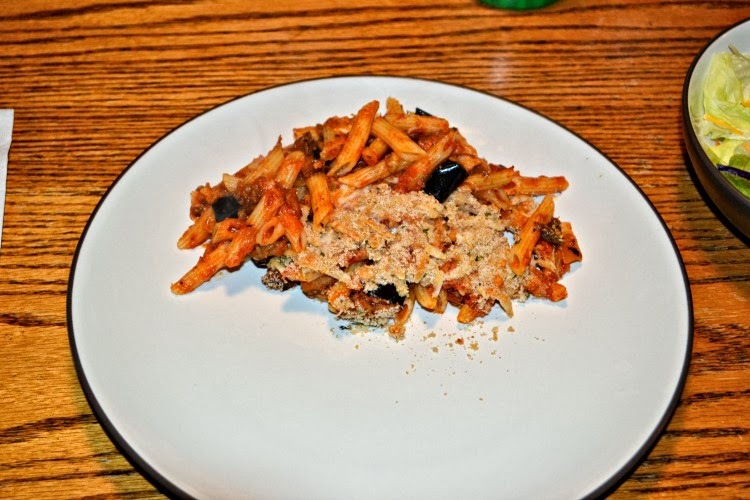 Last night I finally sucked it up and made a new pasta dish. I figured if I was going to cook, I should make my favorite. 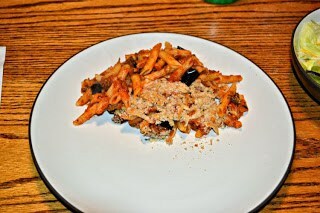 I made an eggplant pasta dish. 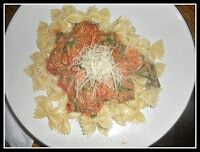 The tomato sauce is packed with garlic, green peppers, and onions then topped it with a ton of cheese. I’m a sucker for a good baked pasta with cheese. The sauce is simple but full of flavor. 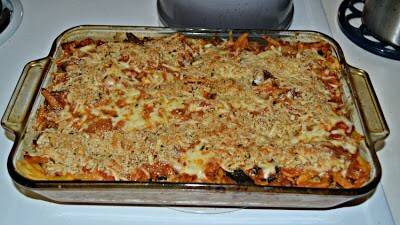 The eggplant adds some texture and flavor and the cheese melts into gooey deliciousness on top. While it took some time to make, it was worth it. 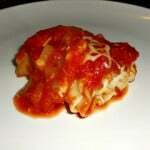 This is a great meal for a cold winter night. 1. Preheat the oven to 425 degrees. 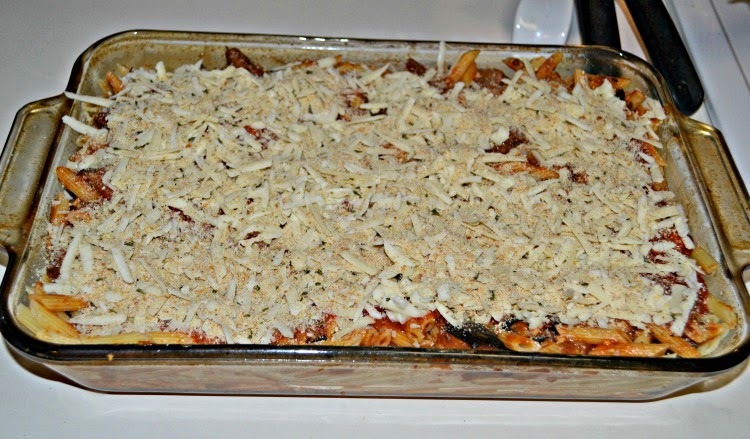 Place the cubed eggplant in a single layer on a baking sheet. Sprinkle with salt. Bake for 30 minutes, stirring after 15 minutes. 2. In a large pan heat the olive oil over medium heat. Add in the onion and green peppers and cook for 5 minutes, stirring occasionally. Add garlic to the pan and cook for an additional minute. 3. 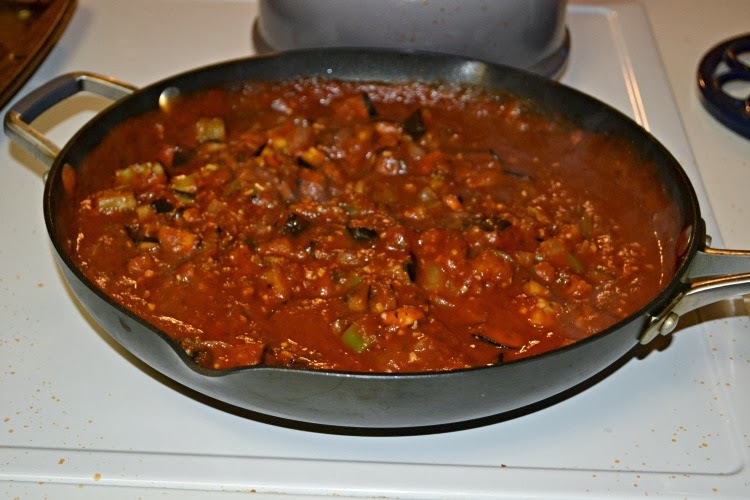 Add wine to the pan and cook until it almost evaporates. 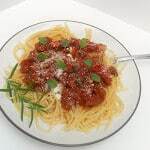 Stir in the oregano, Italian seasonings, red pepper flakes, black pepper, and tomato sauce. Bring to a simmer over medium heat. Simmer for 20 minutes. 4. Cook the pasta according to the package directions. Drain, reserving 1/3 cup of pasta water. 5. Add the pasta water to the tomato mixture and stir. Add in the pasta and mix well. 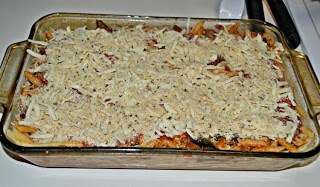 Pour the pasta into a 13 x 9 baking dish. 6. Sprinkle with fontina cheese. 7. Mix together the breadcrumbs, Parmesan, and Asiago cheese. Sprinkle over top of the fontina. Bake at 425 for 15 minutes. 8. Remove from over and serve hot. 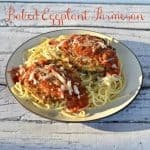 Looks delicious – I don’t cook a lot with eggplant, but I want to try more – I’ve always felt though like it doesn’t have a ton of flavor – maybe I’m doing something wrong? It really depends. SOmetimes I can’t taste it much and other times it adds a lot of flavor to a dish.